While English Christianity has roots in the fifth century and beyond, the Church of England as an institution was the result of the transformation of the church in England by the values of the Protestant Reformation in the sixteenth century. Striking a “middle way” between the Roman Catholic Church and the radical reformers, the English church adopted the central Protestant principles of the normative authority of Holy Scripture, justification by faith, and the priesthood of all believers, while retaining the liturgies and church structures of its ancient past. So, for example, the Church of England places a high priority on the public reading of the Scriptures and it is governed by bishops centered at historic sees, especially the fifth century archdiocese of Canterbury in southern England. That balance of Reformation doctrine and classical worship and polity can be found in the Book of Common Prayer, a collection of the liturgies of the church first written by Thomas Cranmer, Archbishop of Canterbury during the Protestant Reformation. Few works of literature have had a greater impact on the modern English language than the liturgies found in this book. Even Shakespeare quotes from or alludes to this book, which was the official form of worship in the England of his day. We continue to use liturgies largely based on the Book of Common Prayer at Seabury Anglican. As Englishmen spread around the globe in the age of discovery, they took their church with them. These churches, while outside England, retained the worship and doctrine of their mother church. As these churches grew, they both solidified their official connection to the Church of England through a global network of like-minded bishops (who now care for nearly 77 million souls in 164 countries), and established their own independence in the adaptation of the Book of Common Prayer for their own local contexts. Called “Anglican” to identify their heritage and connection, the largest Anglican churches in the world today are increasingly in the global south, places like Nigeria, Kenya, and Uganda. The Episcopal Church in the United States was the product of this process in the English colonies of North America. During the last twenty-five or so years, many in the Episcopal Church were grieved to see the historic Christian truths of the Anglican tradition abandoned. At the urging of Anglican churches in the global south and with their full support, new churches were formed in the United States and called “Anglican” to communicate this relationship. Seabury Anglican is one of those churches. Together with nearly 1,000 other Anglican congregations in the United States and Canada, we form the Anglican Church in North America. Why haven't I heard of your church before (especially since you have such a long history)? The Anglican church is the Church of England, which developed a special distinctiveness in the reformation. The teaching is much older than that-- the reformers aimed at recovering earlier focuses and practices of Christianity that had been obscured over time. What's your connection to the Episcopal church? Our churches in North America were often called Episcopal churches, but as many Episcopal parishes moved beyond the authority of scripture and the historical teaching of the church, we recovered the traditional name that reflects our rootedness in traditional Christian teaching. I don't know some of the terms you're using on your website. Could you explain them? Anglicanism - Having to do with the Church of England. Bishop - A church leader over a certain number of local churches. CANA - A structure of church leadership that we're under: the Convocation of Anglicans in North America. Catechism - Teaching, especially of the essential doctrines of the church. Common Prayer - A resource of prayers and blessings that we use in service and in daily life as disciples of Christ. Communion - Also called the Lord's Supper or the Eucharist-- this is the wine and bread that baptized believers partake of. Jesus Christ, on the night he was betrayed, told his disciples to take and eat these in remembrance of him. Creed - t means, "I believe." It expresses the key things we believe in as followers of Christ. Episcopal - This is a form of church government in which bishops preside over a number of local congregations of believers. Evangelism - To evangelize means to share the good news of the kingdom of Jesus Christ. Ministry - An area of service to others. Parish - A parish is a specific, local gathering of Jesus' disciples. Rector The rector is the primary spiritual leader of the parish. Vestry - Literally, a vestry was a room where the priest's robes (vestments) were kept. Now the term has come to mean the committee of people who make decisions, since these committees often met in those rooms. Warden - A church leader, responsible for much of the regular upkeep of the parish and property. 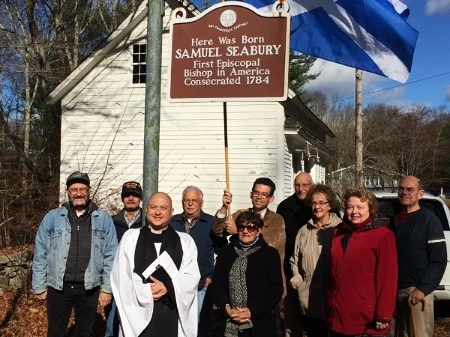 BISHOP SEABURY ANGLICAN CHURCH IS A COMMUNITY OF BELIEVERS WHO SEEK TO KNOW JESUS AND MAKE HIM KNOWN. WE ARE LOCATED IN GALES FERRY, CT. ALL ARE WELCOME!